How many of you are “Skylanders” fans? Woah! We can see several hands raised, which explains that this action video game series, created by Activision is highly popular with both kids and adults alike. 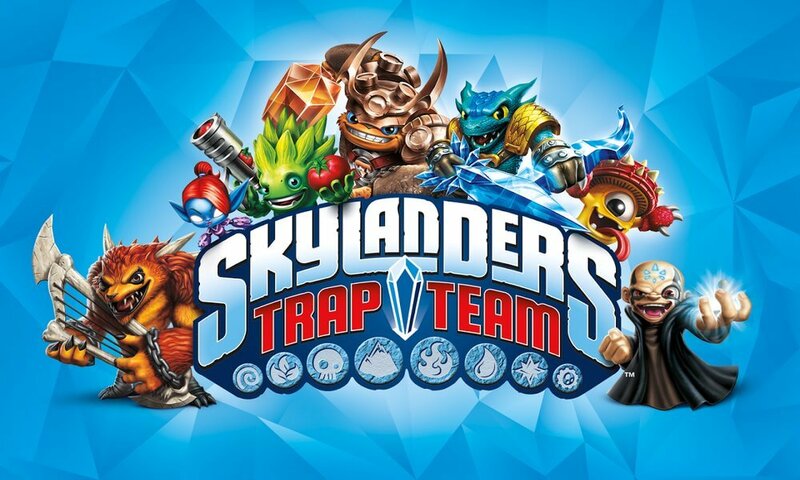 For playing the game, the players have to place the Skylanders, the inhabitants of Skylands on the Portal of Power, a device that reads the tags of figures through NFC. 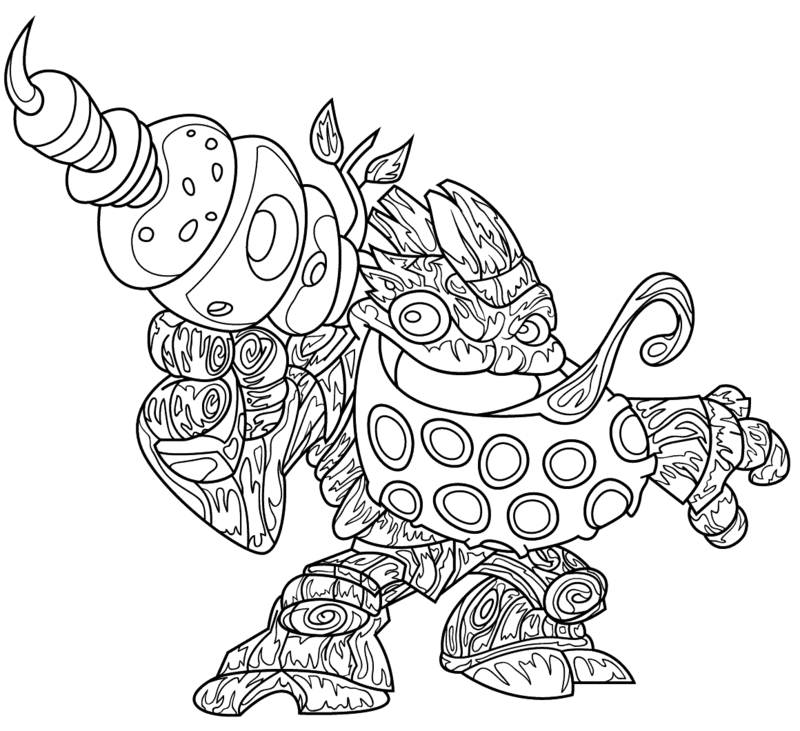 If you enjoy playing Skylanders, you’ll have a gala time filling Skylanders coloring pages too! Before that, let’s give a short description of the game to people who are not aware of it. The setting of the game takes place in the world of Skylands, a realm filled with floating islands and adventure. Located at the center of the universe, Skylands is always threatened by evil forces who try to gain prominence and access to all worlds. However, there is a group of heroes, called the Skylanders, who challenge these evil forces and defend the world with their abilities, powers, and machinery. The Skylanders work with the Portal Masters to keep balance and peace in the Skylands by battling the force of evil and protecting the Core of Light. Each Skylander is associated with one of the ten elements of Skylands- Water, Magic, Air, Earth, Fire, Tech, Life, Dark, Light, and Undead. 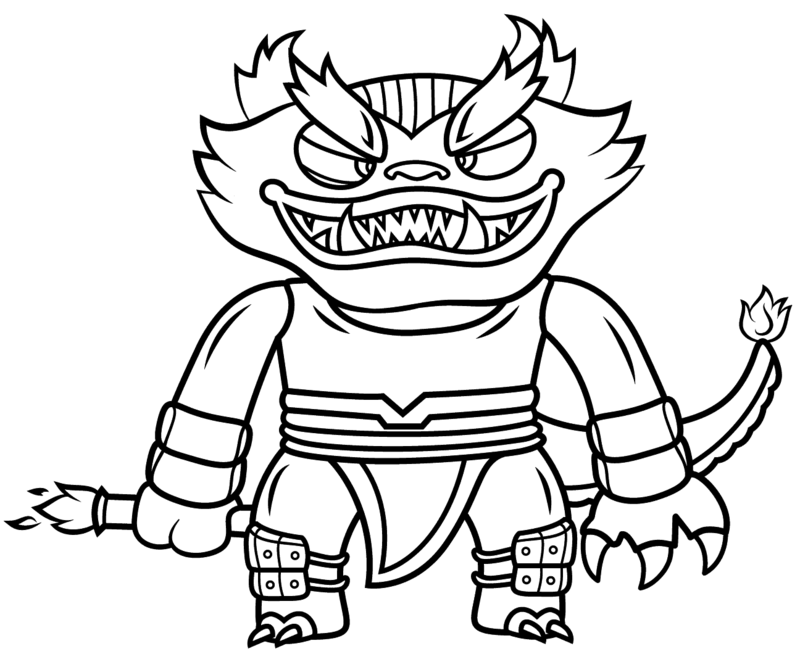 The Skylanders go through different levels to prevent the main antagonist Kaos, from ruling over the Skylands. 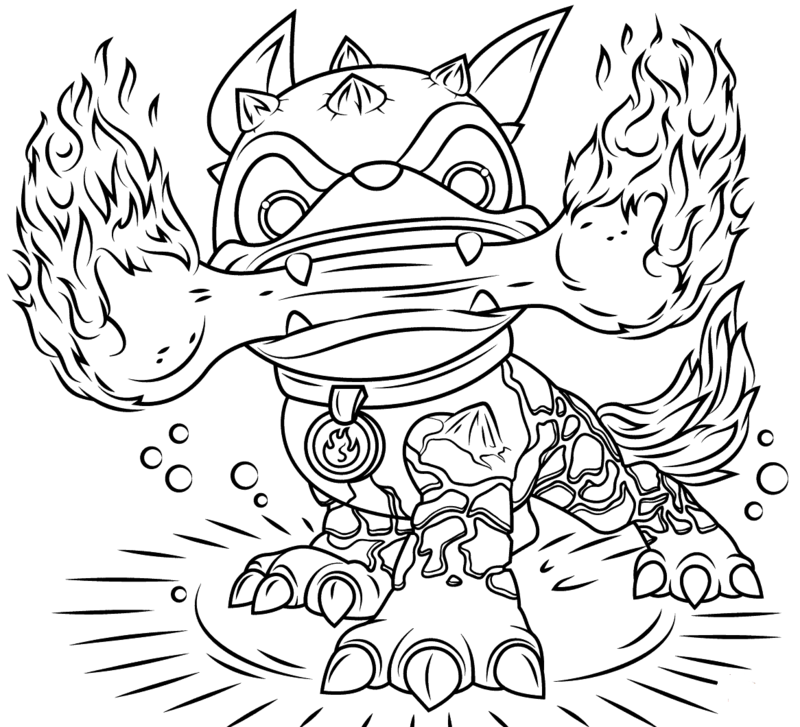 Now that we have acquainted you with the storyline of Skylanders, it’s time to check out the printable Skylanders coloring pages. Bash’s only wish since childhood has been to fly. 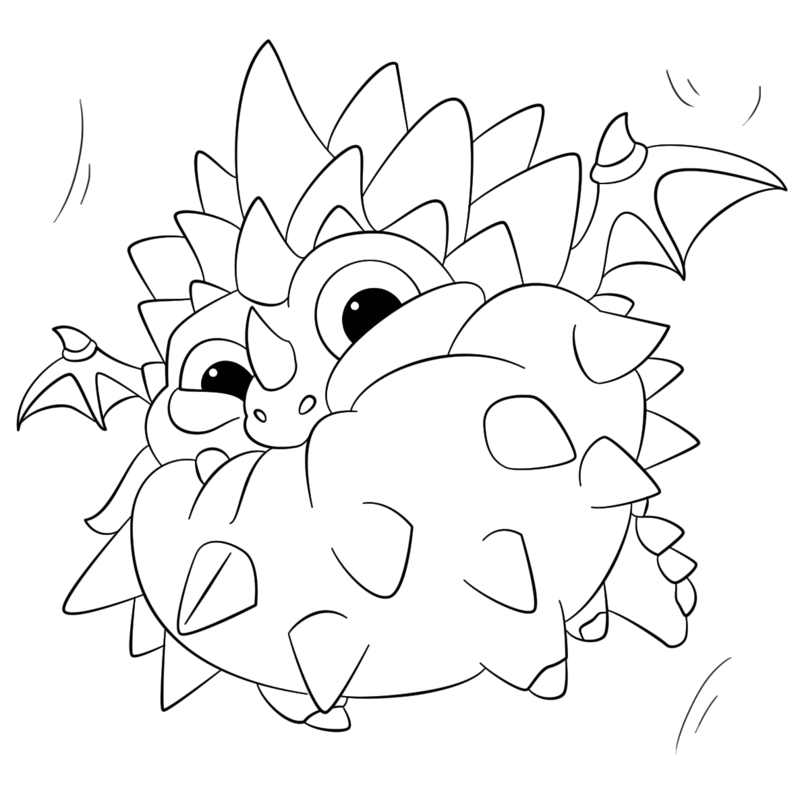 This rock dragon with a never-die spirit, tried to learn flying by curling into a ball and rolling on the ground. This did not make him fly but definitely hardened his outer skin. He is a protector of Skylands and his friends. His enemies fear his thunderous courage. Color him in rock colors like dark brown. A formidable combination – Blast Zone the charming furnace knight and Mini Jini the sweet-hearted enthusiastic Skylanders Sidekick from Skylanders mini-universe! Both of them represent positivity and the goodness in life. With Blast Zone, the bomb troll disarming specialist at her side Min Jini is ever ready to save Skylanders from its enemies. 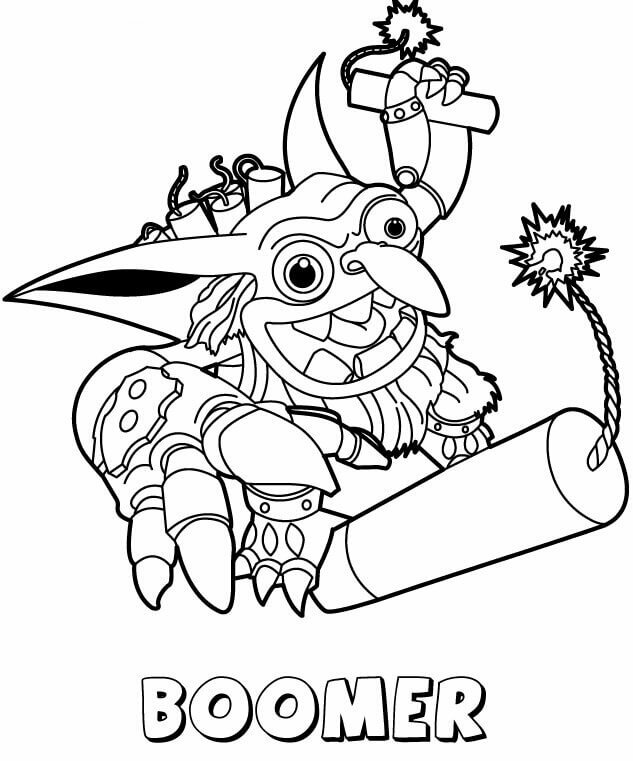 Boomer, the only troll to be a Skylanders was initially a Bomb Troll after which he underwent five replacements to be in his final form. Bomb Trolls’ only mission is war and spread of evil! 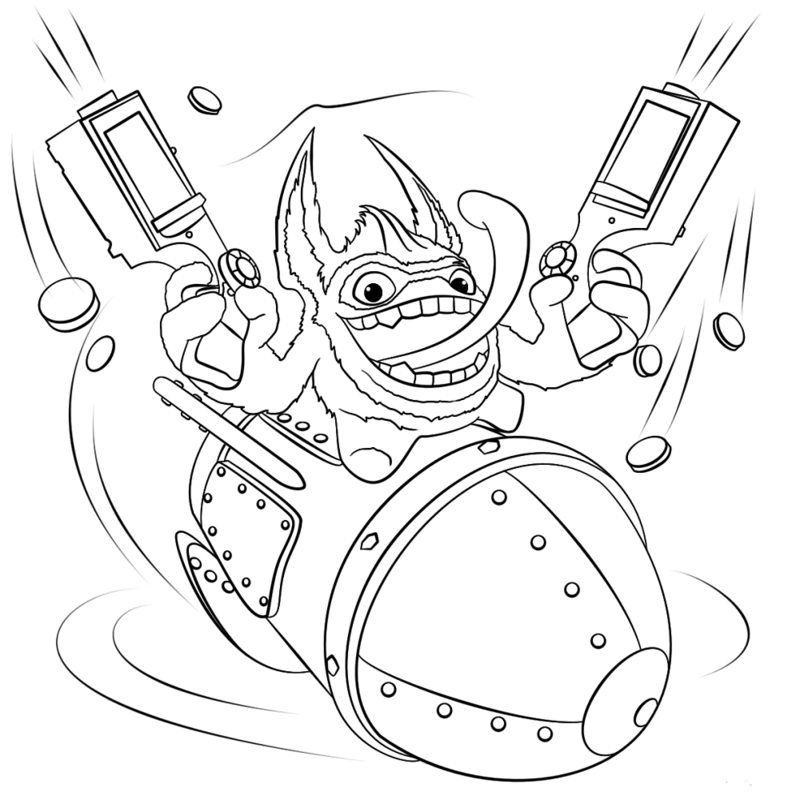 Boomer’s only love is to blow things up, a common trait of all Trolls. But eventually he realizes that he is not fond of wars and destruction, and now he is always at the forefront to save Skylanders from evil. 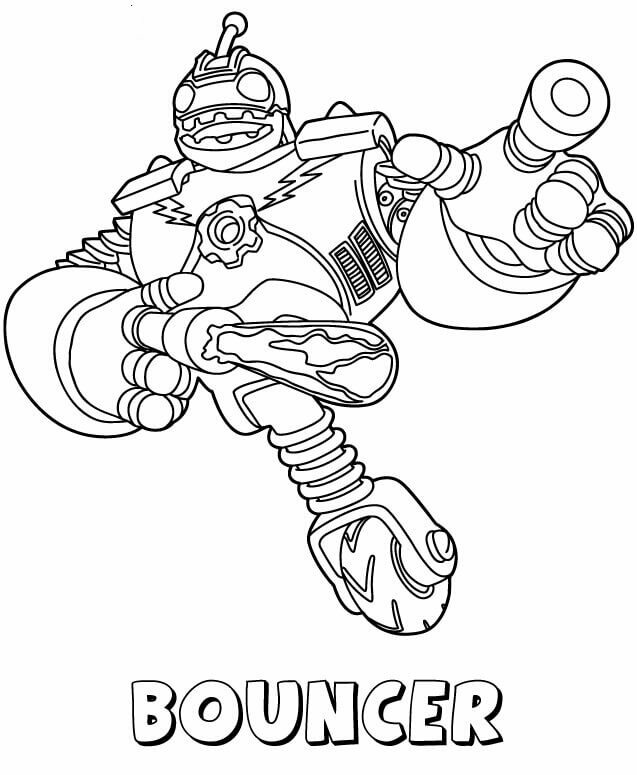 One of the eight giant Skylanders, Bouncer, was once a much acclaimed Roboto-ball player with a huge Mabu fan base. It was due to his fans that he gets the confidence of fighting the Arkeyan lords with the help of the Skylanders. 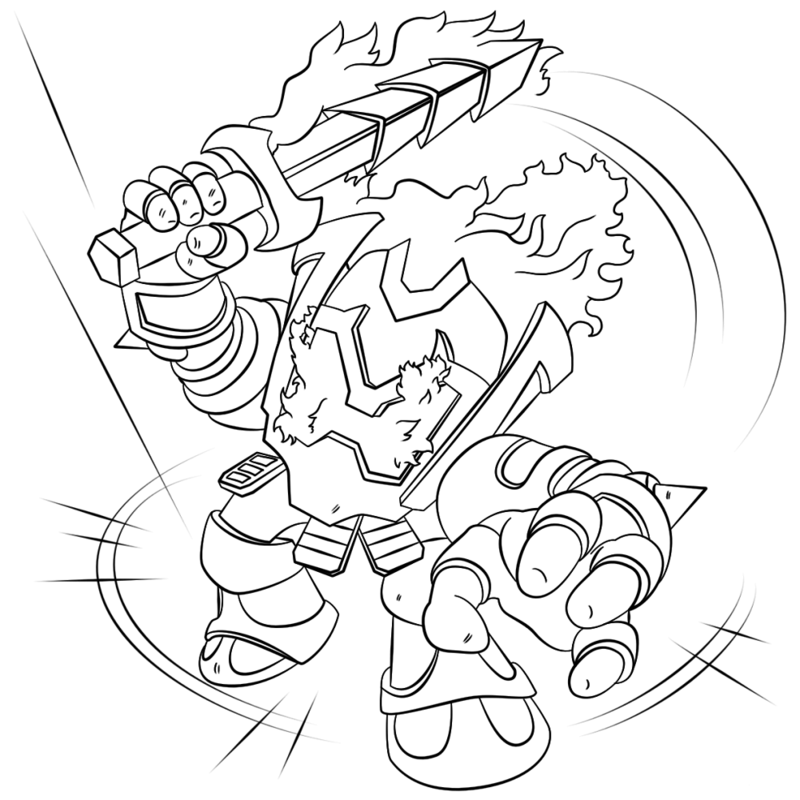 He is a courageous and lively Tech Skylander. 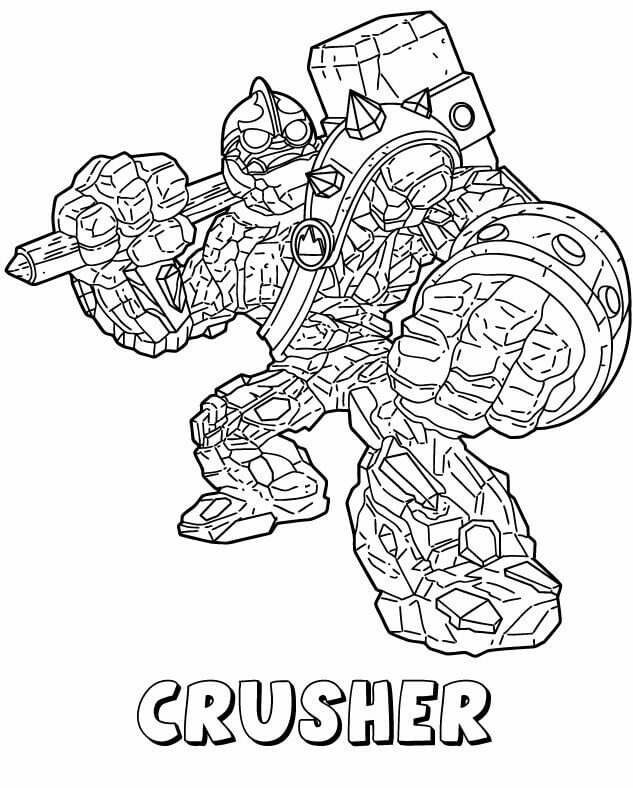 One of the eight giant Skylanders, Crusher’s biggest weapon is his three-ton hammer, and biggest love is to crush the Arkeyans’ robots. 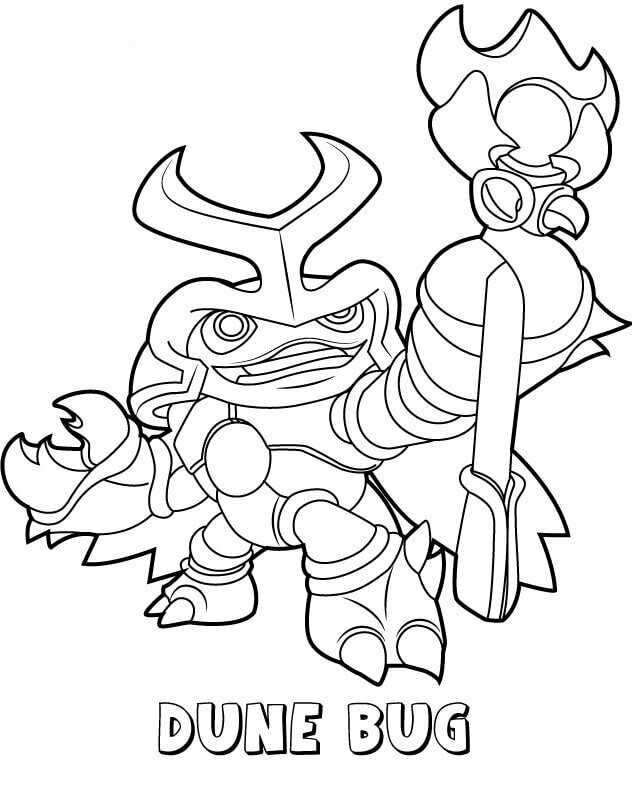 He is made of stones and is an Earth Skylanders. Once he has firmed up his mind, he cannot be stopped from completing his mission. In his robotic suit capable of shooting laser beams from his eyes, improvised flight technology, and a booming voice, Drobot is a dragon but with superior powers than a mere dragon. He is intelligent, logical and technology savvy. He ferociously stands by Skylanders in their battle against the Arkeyan evils. A beetle Skylander with magical powers, Dune Bug, saves his clan by digging deep into the ground and burying his city in the undergrounds, out of reach of the enemy. He has a magical staff accompanying him everywhere. This lava monster from the Skylanders has zero tolerance for any enemy of Skylanders. This outspoken monster born from the eruption of a volcanic island is always steaming and fuming ready to erupt and is never scared of speaking his heart out. Born from the Popcorn Volcano, he was accidentally discovered by a team of Skylanders. True to his species, Hot Dog is fiercely loyal and aptly uses his power of smell to get his friends out of danger. Remember to give the picture a halo of fire colors! Bubble Blast was a beehive brought to life by the magical honey in it so that it could defend all the bees from Kaos’ minions. Not only the bees, Bubble Blast believes in protecting all animals in the forest and mountains. Called initially Ignatius, Ignitor is a fire spirit knight Skylander, and Terrafin is a dirt shark Skylander. Both of these heroes are always ready to protect the people of Skylanders with valor and courage. Color Terrafin with black all over with white underbelly and the spots on his back are a shining mix of red and orange. Color Ignitor with flame colors and his suit in dazzling blue color! Part of the core team of Skylanders, Fright, and Rider go hand-in-hand in fighting for off all evil. Fright is an ostrich that initially was a timid creature, but when he ate a bag of oats, he was condensed to a skeleton after which he rescued Rider and gained courage and became brave. As a team, they do not think twice before jumping into the fight for righteousness. One of the eight giants of Skylander, Eye Brawl is formed by teaming up the flying eyeball and the headless giant. Though initially these two were staunch enemies and they fought a long battle, they finally realized that by sticking together their powers would double up so that no one could defeat them ever. 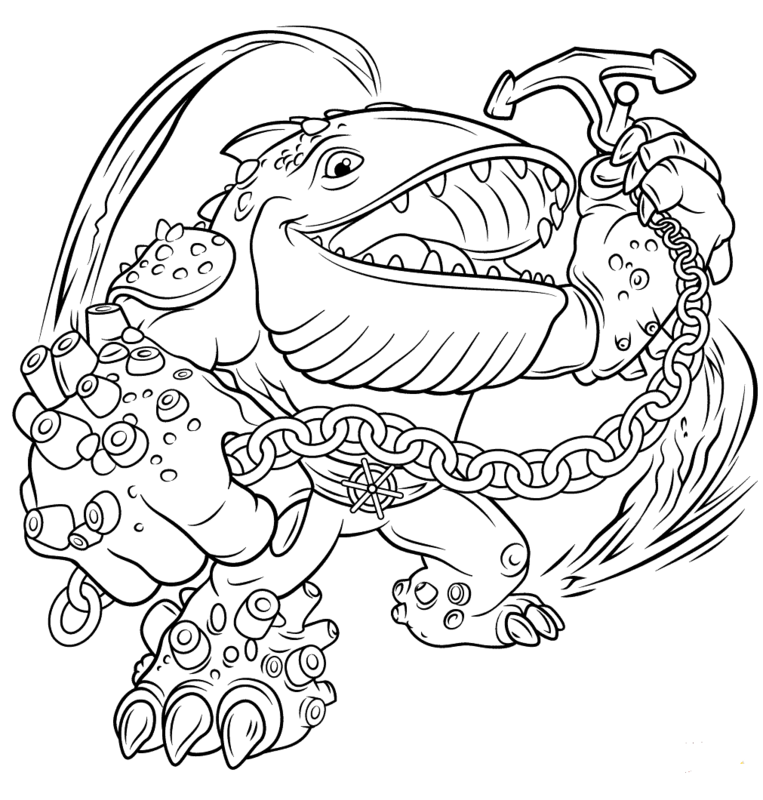 One of the eight giants of the Skylanders, Thumpback is passionate about fishing as he is a whale-like ogre. He is thoroughly patient and is dependable to the hilt. 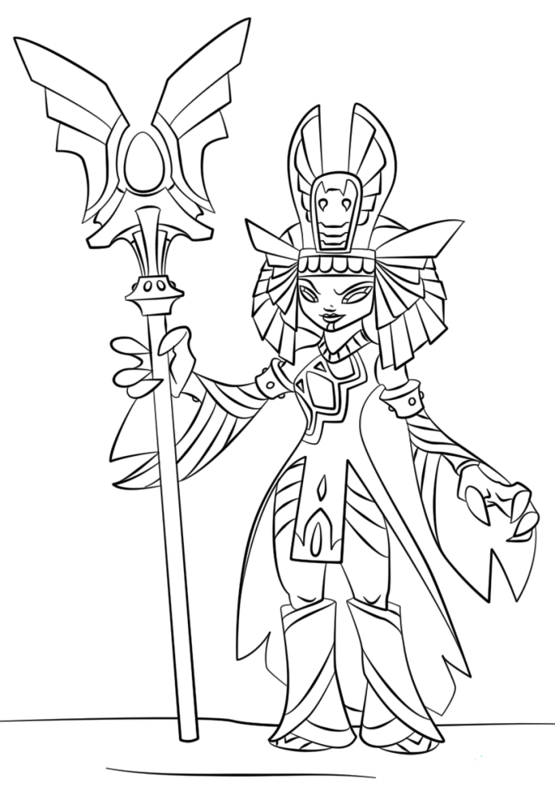 Color this queen in gold. She is a statute and heads the wicked Doom Raiders. She is fearsome and greedy for gold so much so that she turns everything in her way into gold. 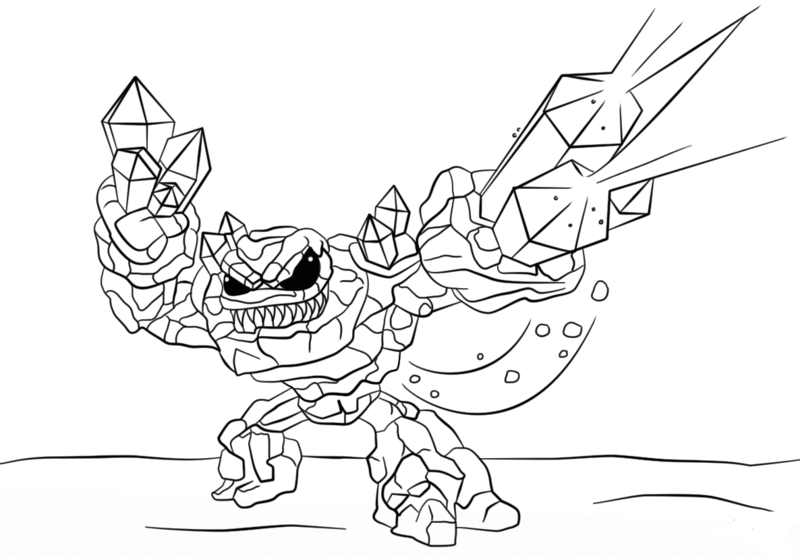 Named Prism Rock, this one belongs to the Crystal Golem species. He is a loner and prefers to be left to himself. 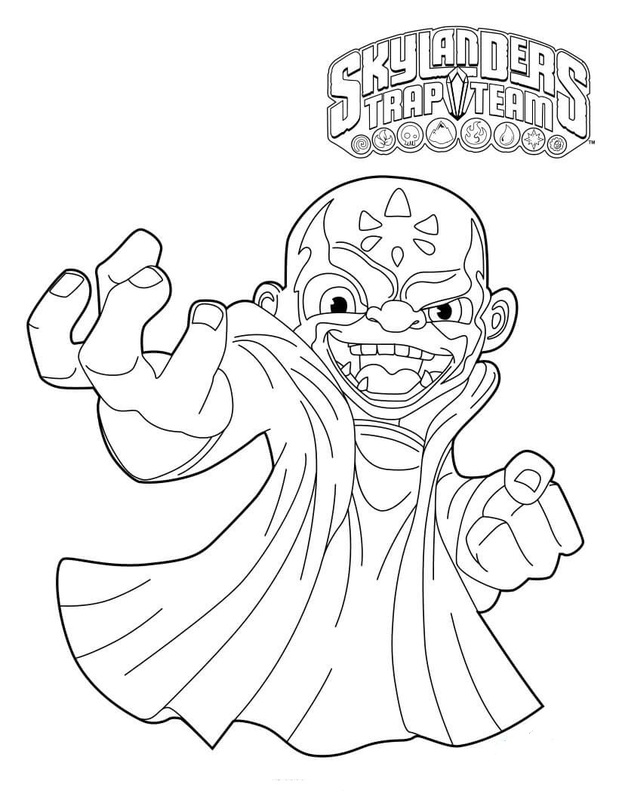 However, in times of need when the enemies attack Skylanders, he is ever ready to use his gem-powered capabilities. This spirit knight hates witches as he was deceived by a witch to wear a magical armor that would help him fight the dragon. He was, however, transformed into a fiery spirit burning with fire and since then he is always prepared to fight evil forces to save Skylanders. 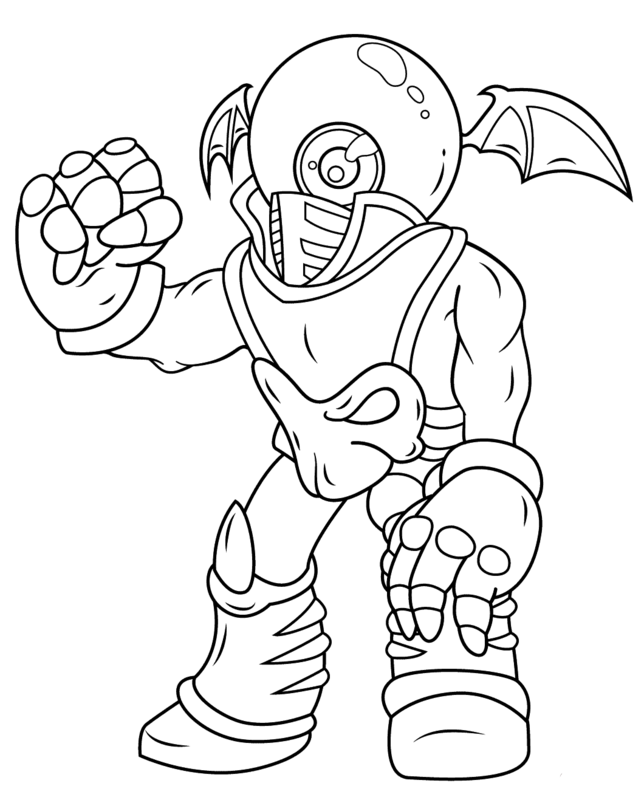 Kaos is the main adversary who is ever plotting to capture Skylands and had banished all the Skylanders to Earth. He has been characterized as selfish, egoistic, overconfident, cunning and suffering from inferiority complex. He has mastered the art of Dark Magic and is incredibly destructive and ambitious. 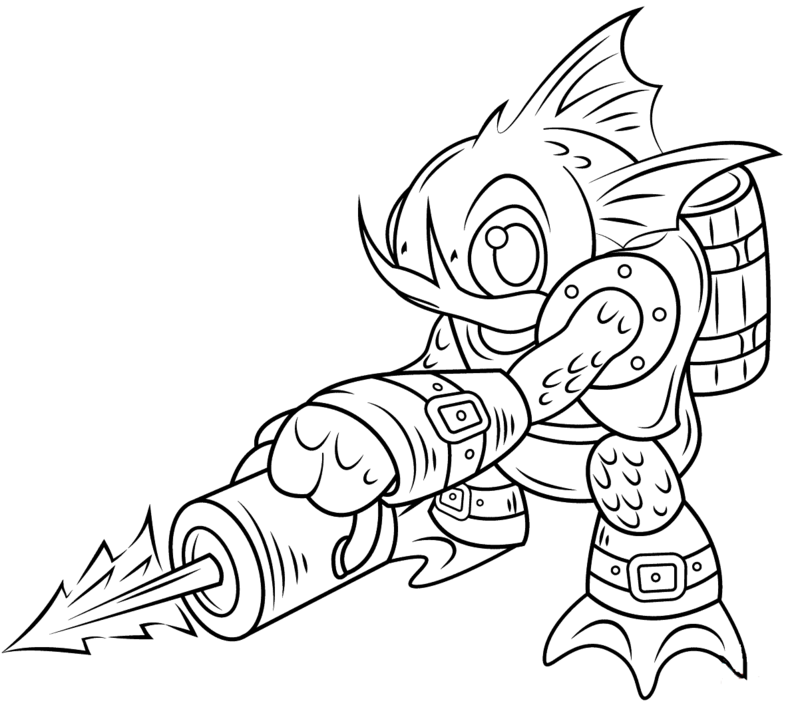 A Gillman, this fish Skylander is full of bravery and courage, loyal and confident, protective with a heart of gold. His friends are very fond of him, and his best friend is Spyro. An elf she was taught stealth fighting by a tree-like ninja. She loves and guards the Skylands forests, is upfront about her thoughts and also uses tricks at times to escape from situations she does not like to deal herself. A penguin Skylander, King Pen’s main weapon is his blades. His belly is white, has yellow beak and eyes and wears black and gold colored blades. He has a ponytail too. 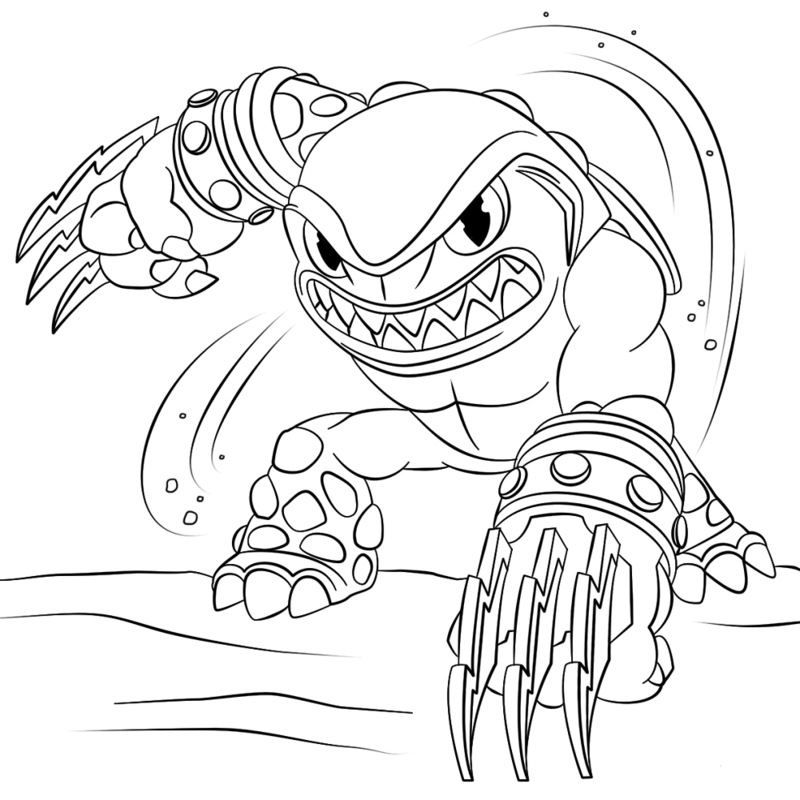 He is the leader of the Skylander Sensei and is educated in ‘Flipper-fu’ and primeval warfare style. 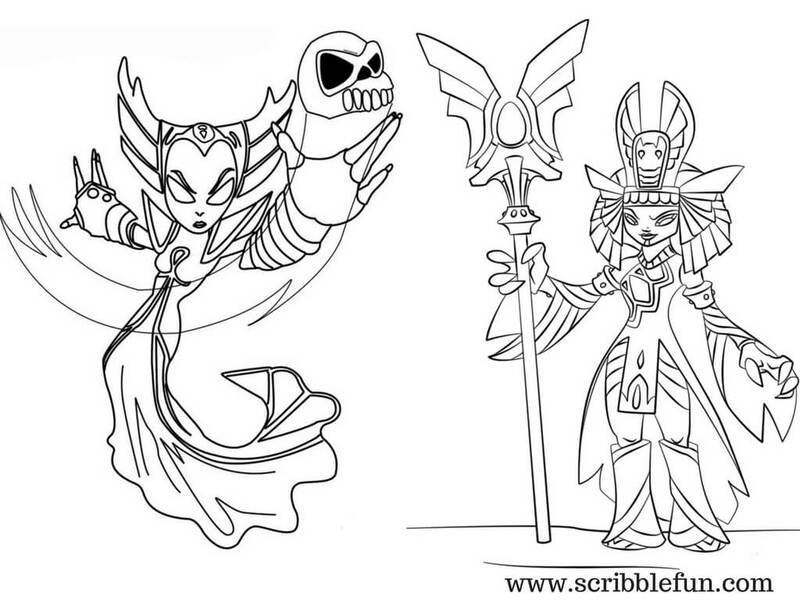 Here’s a coloring sheet of Golden Queen and Hex, two female characters who so similar yet so different from each other! Both are witches and considerably wicked but Golden Queen channels her evil behavior towards greed and spread of vice whereas Hex utilizes her magical powers to help good win over evil. A fun-loving heroic dragon Spyro belongs to the Magic element. A quick learner with the ability to jump into immediate action, he has an eidetic memory which helps him remember images vividly. Hex has risen from the undead. She is an elf witch wearing a black headdress and a sleeveless black dress with love for skulls and magic. 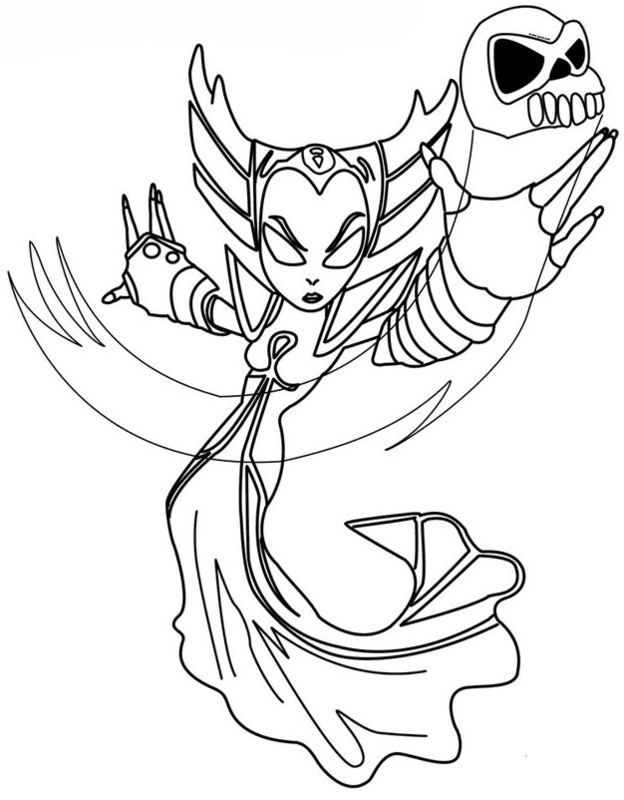 She is an ally of the Skylanders though she is considered sinister and untrustworthy by fellow Skylanders. 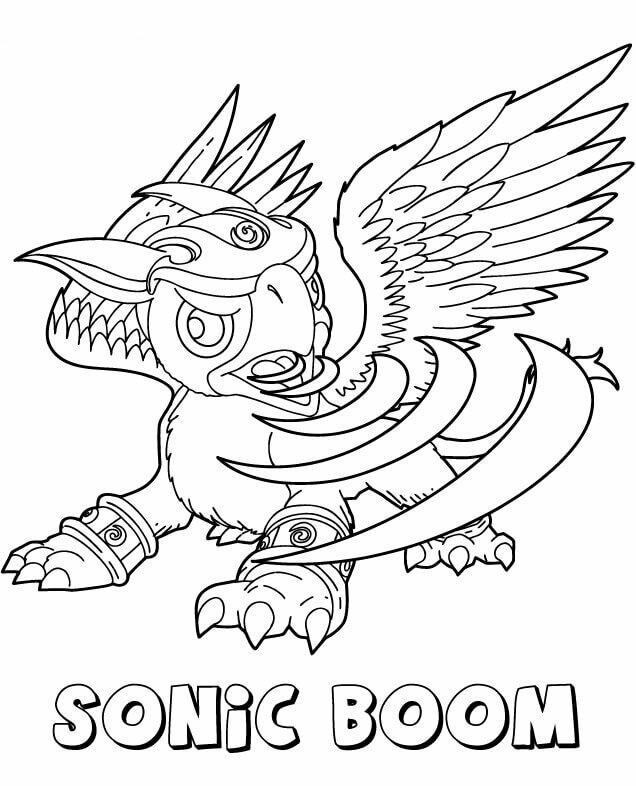 From the Air element, Sonic is a black colored griffin. Her hatchings having been placed under a personal curse from an evil wizard, she understands the maternal anguish and hence is always protecting all Skylanders as a mother. 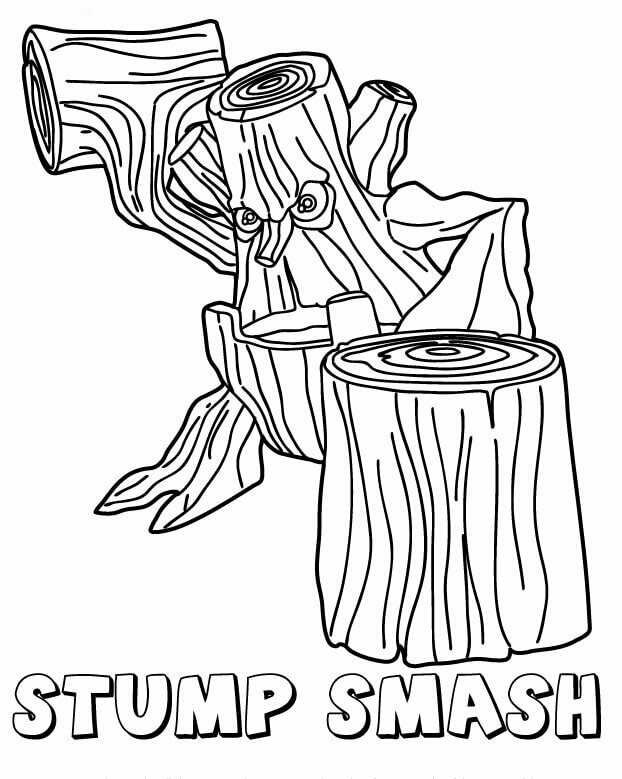 Belonging to the Life element, Stump Smash is actually a magical tree, green and brown colored. Initially, he was a peace loving tree sleeping all the time. Ever since he has been cut he is perpetually in anger against all evildoers. A Chinese dragon belonging to the Fire element, Kraken grew up on an island surrounded by an ocean of fire. He successfully saved his island from destroyers by using his magical wand. He can burn down anything and anyone except himself. The scientist and alchemist, always experimenting and creating magical potions and causing accidents in the lab, this blue colored gremlin is the crazies and the over-enthusiastic Skylander around. Since the color of his skin keeps changing, use your creativity to color him aptly. 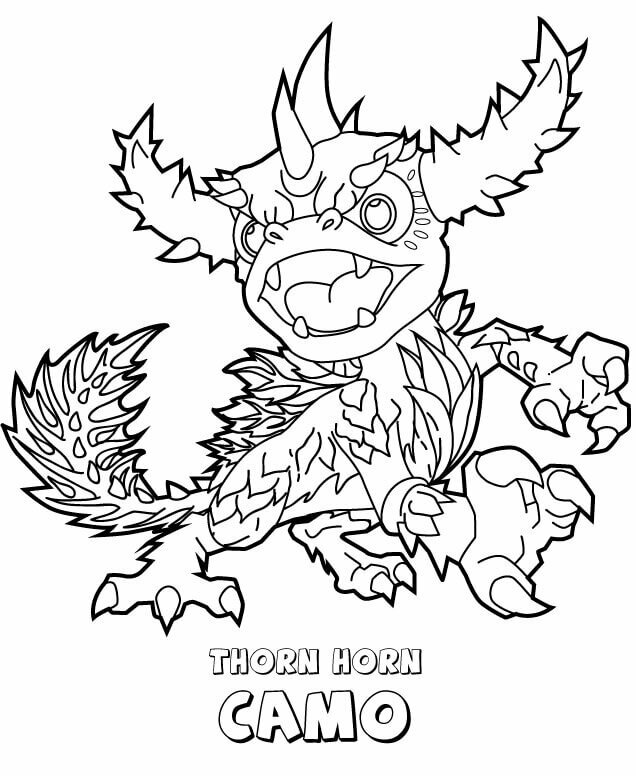 Part of the Skylanders team protecting their motherland, Camo is a hybrid of a dragon and a plant. Ever energetic he loves to play pranks. His favorite trick is to cultivate fruits and vegetables at a magical growth rate that they explode on anyone’s face putting them into shock. Notice-worthy is that he has a green body with fire spitting out of his mouth like that of a dragon. 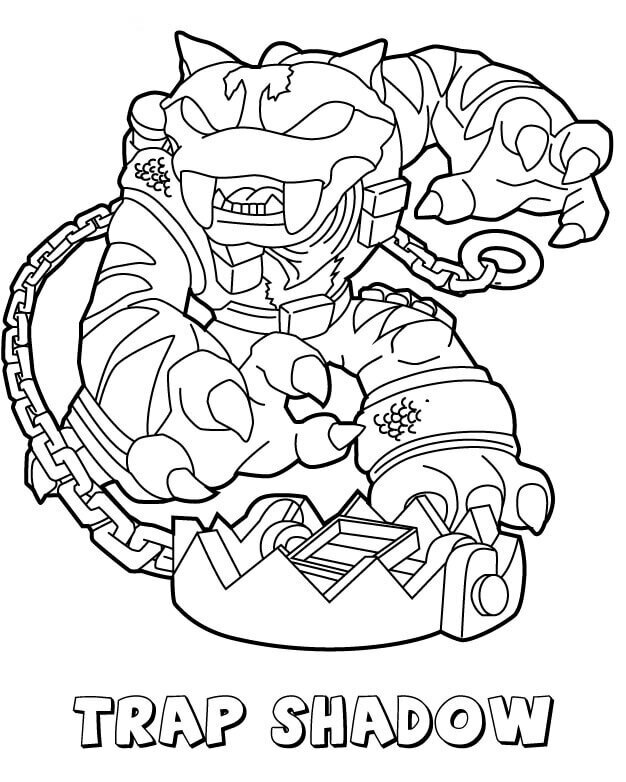 An early riser, Trap Shadow is a feline Skylander. This catlike character loves his own company though at times he does try to work as part of a team. His best feature is his ability to catch practically anything – he uses his cattish slyness to do so – using traps and his sneaky abilities. As his name suggests, his solution to being happy is to be trigger happy. He carries with him his custom-made shooter from which ejects randomly gold coins in every direction. Remember to color his shooters in golden color. 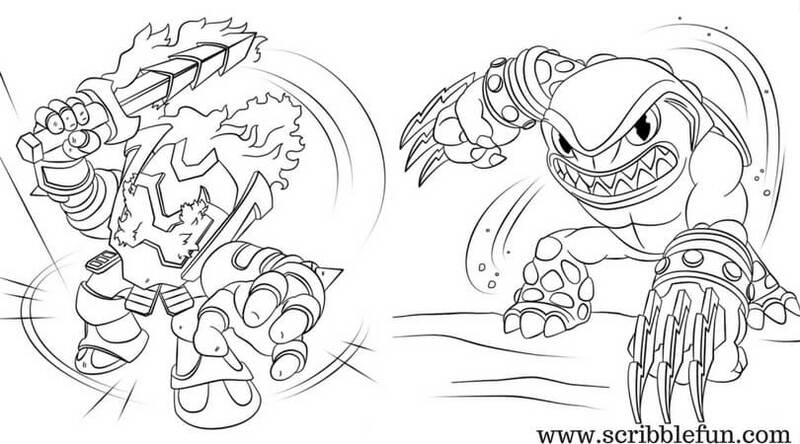 Aren’t these action-filled free printable Skylanders coloring pages totally amazing? 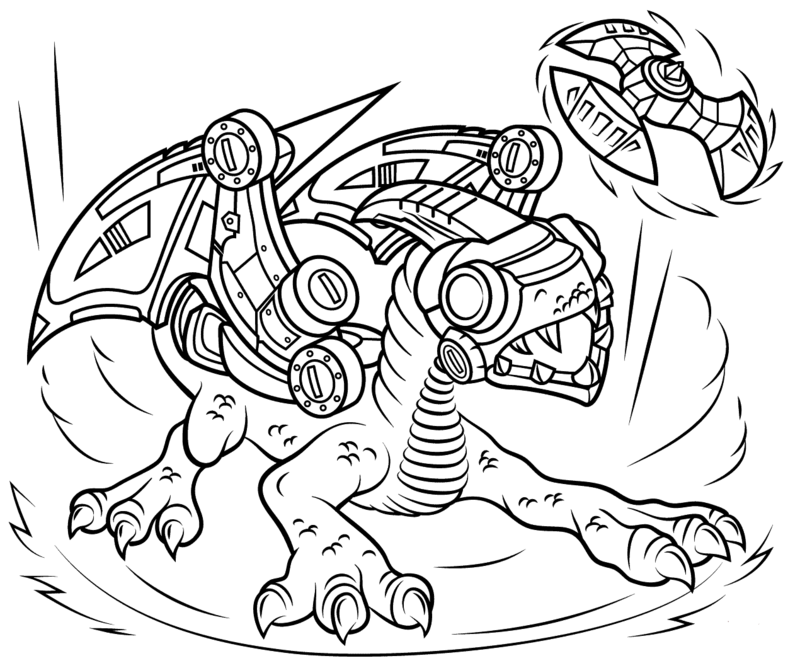 Filling these coloring images would be even more fun, and we guarantee you that! 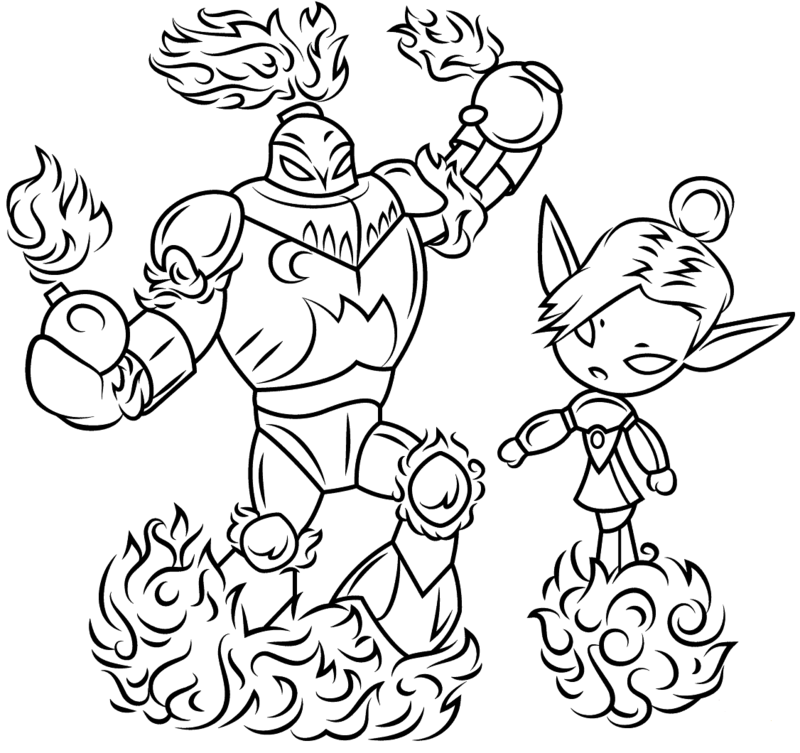 How about the print out all these images to create Skylanders coloring book. Let us know by commenting below. 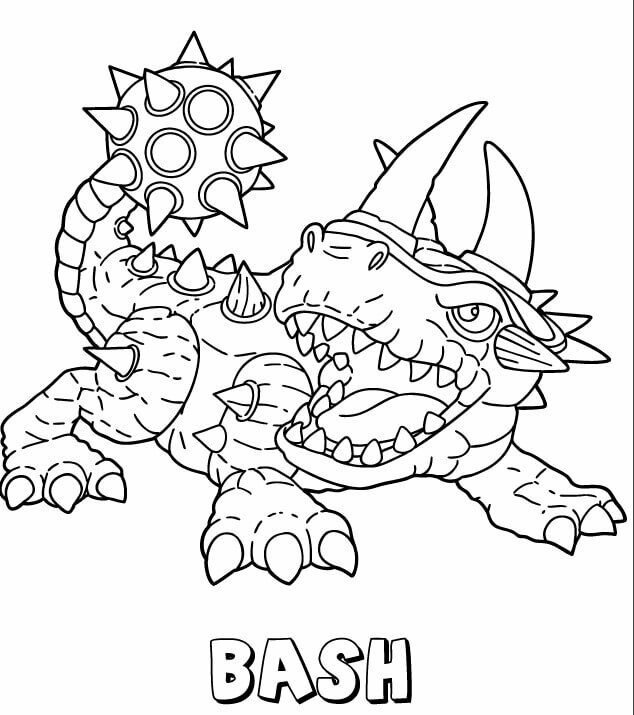 And please check out our Captain Underpants coloring pages too!